1 What is the exact definition of lighted nock? 2 What are the benefits of Lighted Nock? 3 Are lighted nocks legal? 4 What color of lighted nocks should you use? 5 What are the popular brands of lighted nocks? 6 What is the average price of lighted nocks? 7 How does a lighted nock work? 8 How to choose a good lighted nock? 9 How to make or install a lighted nock? 10 How to turn off the lighted nock? 11 How will FOC change with lighted nock? What is the exact definition of lighted nock? Lighted nock is a tool that is designed to aid you in track an arrow’s flight at high speed even in low light conditions. The innovative tool is actually glued in the end part of an arrow since it allows you to easily place the arrow on the string. What are the benefits of Lighted Nock? If you are a hunter, the lighted nock enables you to easily follow the way of your arrow and its impact on the animal. It is so bright that you can easily see it even when you are hunting at a sunny midday. Consider the significance of knowing what part of the animal you hit during the recovery process. Without the lighted knock on your bow, tracking an arrow would be more difficult. The tool serves a locator for the recovery of your arrow even when you hunt in low lighting conditions. Such can save you a lot in spotting and recovering your animal in case the arrow fails to completely pass through it. The light tends to leave a mental snapshot in your mind as it disappears into your target animal. Lighted knock also offers easy fitting of your arrows to the string. It is also perfect into the current set up of your nocks. This only means that the nock will make you a better hunter compared to the other shooters or hunters mainly because it will help you recover your animal. Moreover, the little beams of its light add fun at the time of your shooting. Always check for the legal usage of lighted nocks in the area where you will hunt as not all places allow them. Keep in mind the variation of hunting regulations by a hunting club, by state and season, and by county. This will spare you from ending up facing legal charges. What color of lighted nocks should you use? Green lighted nocks are best in instances where green seems not visible in the landscape. Red lighted nocks are ideal for turkey hunting during springtime, early season whitetail hunting, and elk hunting in September. As per hunting activity, yellow lighted nocks are not advisable as they unlikely show up against various colors in any season. Blue lighted nocks are used by hunters in locations where blue is not dominant, making the search for the arrow a lot easier. 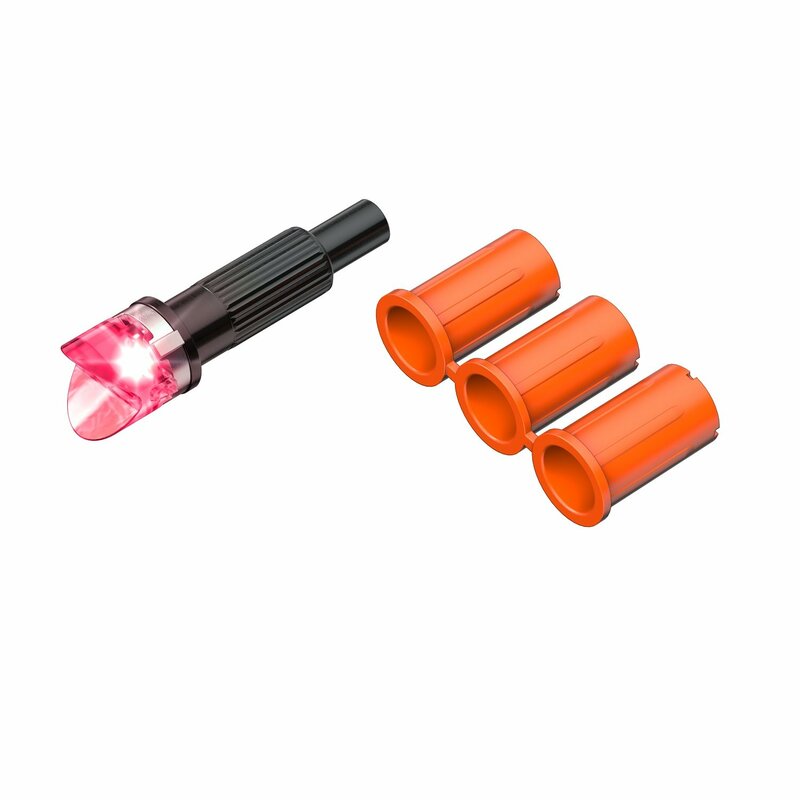 Lighted nocks in pink color seems so bright in contrast to the surrounding that enables you to easily track the game animal. Among these colors, red lighted nock is considered by many hunters as the best in targeting their subject of shoot. What are the popular brands of lighted nocks? For many hunters, the success of their hunting depends on the brand of their lighted nocks. Among the remarkable ones available in the market include Carbon Express Launchpad Precision Lighted Nock, Clean-Shot Out Lighted Nock, Nockturnal-GT Lighted Nocks, Lumenock Lighted Nocks, Carbon Express Launchpad Crossbolt Lighted Nock, and the Firenock Lighted Nock. What is the average price of lighted nocks? Apart from the brand, color, benefits, and legality of lighted nocks, their price is a must factor to hunters. Each lighted nock is priced depending on its brand and features. One nock may cost $7 to $50. It will be cheaper when you buy lighted nocks in a pack, which is oftentimes in three items. How does a lighted nock work? A lighted nock is specifically designed for use along with an archery projectile. It takes precision and fine tuning so as to attain its maximum performance. It features an insert that fits within and shouldered against the end portion of the projectile shaft. This insert has a recess that terminates on the floor and a face bear against the knock shoulder. Meanwhile, its battery/LED assembly fits within insert’s recess leading to the lighted nock. Notice an activation gap between the body of the battery assembly and the LED lamp preparing for a fire. The nock operates automatically in speed change and activation. How to choose a good lighted nock? Although the lighted nocks these days sport a wide range of activation technologies, there are still things you need to consider when you go shopping one for your own. These factors include but not limited to their price, ease of use, reliability, brightness, weight, color, manufacturer’s instructions. Of course, you have to be very specific in taking these factors into consideration when you are in the store already. Price – As mentioned earlier, the monetary value of lighted nocks vary according to their brand and features. This does not necessarily mean the expensive ones are the best though. You may have to compare one nock to the other and be specific on how you really want your nock to function. The value of the nock quote on your hunting needs will follow. Ease of Use – This is the perfect time for you check the whole features of the lighted nocks and know their functionality. Try each of the lighted nocks offered in the stores you visited and feel its use. Remember you will be using it in your regular hunting activity. Choose one that will make you at ease in targeting the animal you aimed at. Make sure that it automatically functions by simply pulling the lighted nock straight back until such time that you will hear a soft click and its LED is turned off. There should be no magnets and no magnets. Turning off the nock should not be longer than in taking it to shoot. Reliability – When it comes to the reliability of the lighted nock, take into account its durability and functionality features. The brand, quality and parts installation are the contributing factors here. Be proactive in seeing yourself successfully using the tool for long years with no or lesser problems especially in shooting. Brightness – The brightness of your lighted nock may affect the success of targeting your subject and the search of the location of your arrow on the subject. Such brightness should be just enough for to point without catching the attention of your target animal and to locate your arrow during the recovery of the arrow. Weight – Whichever design of the nocks you may prefer to see to it that the system’s weight keeps its weight forward towards the center of the arrow for accuracy. Upgrading or changing the arrow aspects when adopting the lighted nock may be considered to check its overall balance. This will help keep the efficient performance of the tool. Color – Ease in vision should be the primary factor to keep in mind when choosing the color of your lighted nock. A white LED filtered through a colored plastic is mostly used, which makes them dimer compared to green, blue, or red LED. Never choose a green nock when you hunt with night vision to prevent difficulty in picking up through night vision equipment. Instructions – Follow all the instructions of the manufacturer upon installing your nocks. Just ask for a professional help whenever you find any difficulty in installing your lighted nock. How to make or install a lighted nock? – First things first and this is to cut a nock and it should be fit to your arrow. Cut properly that it is just enough for the size of your arrow for ease in hunting. – Glue the LED set to the nock with its arrow. Stick the LED so that it will keep a hold to the arrow. This way you will be comfortable that everything will be okay as you hunt. – Put glue on its second nock then stick it into the arrow. You may find this part just behind the LED set. – Once everything is set you are now ready to try your lighted nock. Either pull or push the nock to make certain that the tool works as very well you expected. You can attest this when it is easy for you to turn the LED set off while using the nock and it does not require any other tools. You will hear a click before the light turns off, thus indicating the success of your installation. Follow these steps before hunting anytime you want so your next hunt will be more than just okay. How to turn off the lighted nock? Yes, you are now using your chosen lighted nock. The next thing you should do then is to turn it off after your hunt. Try to hold the head of its bolt then wag it in both directions (up and down) to lead it to its final off. Meanwhile, think of the fact that each brand of lighted nock has its own approach in turning it off. A Nocturnal nock is equipped with Nocturnal installation, removal and turn-off tool. You may also use the hook as an alternative as well. Lumenok nock makes use of your thumb to turn it off. How will FOC change with lighted nock? The change caused by the front of center (FOC) to the weight and length of the bolt of the lighted nock is visible. The nock is expected to be attached to the end part of the bolt. This suggests that the nock should be light weight to prevent any possible change to its bolt FOC. You can try a lighter lighted nock or one with a heavier point if you realize that the FOC weight is not enough for your hunting activity. Lighted nock may have a weight that is twice to the weight of regular rocks. 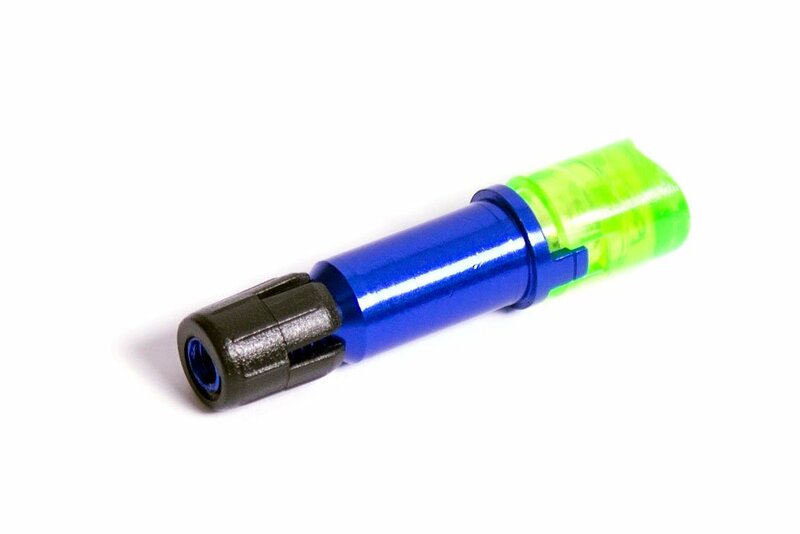 Nockturnal-GT Lighted Nocks are beautifully designed basically made of strengthened plastic. These nocks are equipped with high visibility and lasting lithium batteries with more than 20 hours battery life thus allowing you to shoot at dusk. They are very reliable with its piston driven contact switch that ensures LED illumination. They are superb when it comes to its shock resistant and waterproof design. Any assembly is not a requirement here since they can go straight to the shaft from the package. Preparation is not necessary as well you just have to insert it to make a shot. Good thing here is that they can be fit in gold tip arrows. They are also available in three pack green nocks as well as in pink, blue and red. They set apart from the other nocks because of their durability and ruggedness. They remain glowing for more than 20 hours and are fully optimized and waterproofed for rugged use. However, they are heavy to carry and not as bright as the other brands of nocks. With it weight of 0.8 ounces and dimensions of 5.2 x 3 x 1 inches or 0.6 ounces, the Lumenok GT Nock is made with the use of a Signature nock from Bohning. This tool is specially designed for multiple use enabling archers to follow their arrows. Its design and weight gives you time to replace its battery and activate the LED triggered by the arrow’s impact. It shows no glow when in flight. Just switch the batteries whenever you go afield or right after long practice. It allows archers to successfully follow the path made by their arrows making the tool great for archery other than for hunting. Note that it is the bulkiest and heaviest and complicated design. 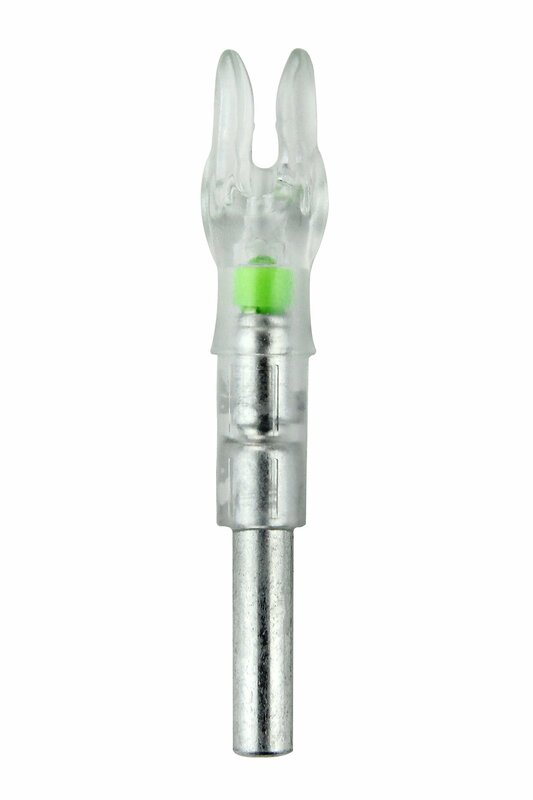 The TenPoint Universal Lighted Nock is perfect for hunters who are into building their own arrows. The tool comes with a universal kit that converts to omni-brite nock system, LED units battery that can last for eight hours, 6 pack accessory package, and LED light activated by bowstring force whenever it is fired. It has an Omni Brite nock with six micro grooves forming bowstring hold channels The components of its omni-brite 2.0 system are available in a six pack. It showcases LED units, Omni-Nocks, receiver alignment tool, reflecting, and arrow receivers for varying shaft sizes. Its fletching tool can be omni-brite nock-fitted so it will be compatible. Some of its users complain about the failure of its universal design to properly engage crossbow. This left them to buy for a new crossbow string and they ended up using it for regular nocks without using its universal design. Clean-Shot Archery Nock Out Crossbow Half Moon Nock is one of the brightest among the lighted nocks in the market. This nock easily traces the path to your target. Its brightness is available in amber and green, which are both very visible and bright. It weighs 0.3 ounces and with dimensions at 1.2 x 0.3 x 0.3 inches; 0.5 ounces. The nock offers a universal fit considering it as a smart present for XBow archers. It goes along with precision bushings to fit relevant carbon bolts. It can be turned off easily though a silver activation collar deactivates it LED for 3D tournaments, lightless practice or traveling thus preserving the battery. Basically, it does not require any tool to turn off. You just have to pull its straight back with its arrow still stick on the target. It uses a disposable battery with 24 hours of battery life. It is intended for crossbows that can shoot up to 350 feet in each second. The design itself gives you convenience in turning it off. It only takes you to pull the nock back, rotate and release for its complete turn-off. Its battery last long that it can keep you hunting in two seasons. It goes to note that you can find the arrow all night if shoot. This is also the sole nock that can be permanently turned off. Its only downside is its weight that is why it is larger compared to the other nocks. Specifically designed for hunting and archery, Carbon Express LAUNCHPAD Crossbolt Lighted Nock makes use of the heavier crossbow bolt, which makes it more rugged, brighter, and offer more performance in the hunting field. This nock is manufactured by Carbon Express, which is giant firm in the archery industry. An aluminium unit is prepared to be out in the market after tailoring the fully adjustable designed intended for exact crossbow bolt. It is of universal fit and is exceptionally large. This nock uses high-quality LED nocks, which is excellent on the heavy side. Its mechanism functions around an integrated aluminium housing. Its reusable spacer tube can be removed every time the crossbow is cocked. Its bowstring’s violent force activates its LED to glow. 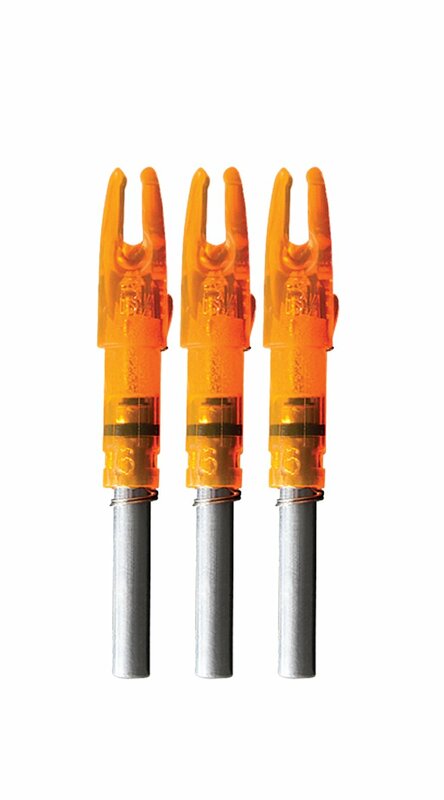 It hits one out of the park with design offering the best solution bringing illuminated nocks to the industry of crossbow bolts. Its shallow V design is reliable and consistent and cannot be hindered by LED addition. It is an excellent launch pad nock. On the other hand, this lighted nock is heavy, bulky and requires the removal of its spacer. Carbon Express LAUNCHPAD Precision Lighted Nock is perfectly designed lightweight, precision engineered and balanced to fit high-speed and compound bows. 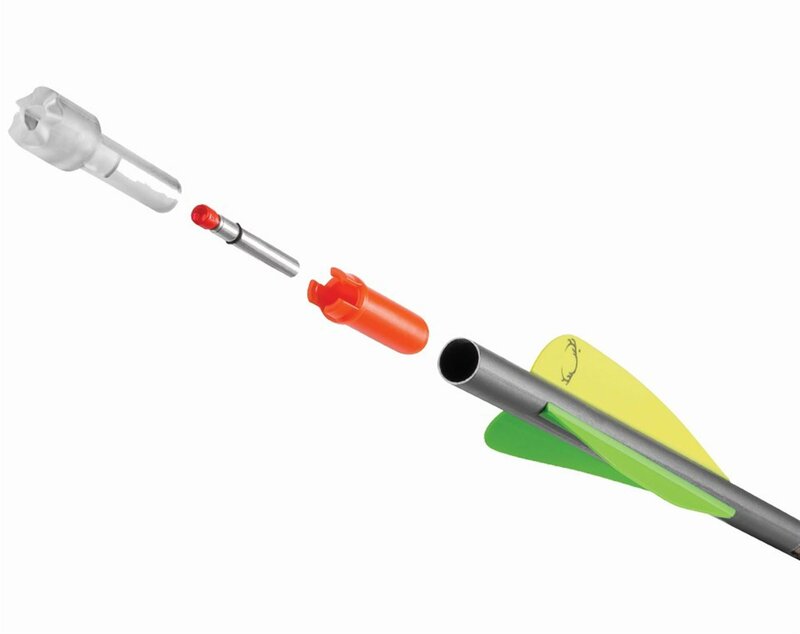 The tool highlights precise contact points designed for the release of controlled arrow. It comes with the lightest weight equitable to its superior accuracy. Take note that it is release activated already. It is only weighs 18.5 grains and is used with undamaged carbon arrows with a diameter from 0.244 in. to 0.246 in. Considering the fact that it is manufactured with high standards and perfectly engineered with four-axis straightness, it does not lessen the arrow front of center since it is lightweight. It has high visibility LED with lasting battery life. It is secure enough for any draw since they revolve around precision manufactured and engineered nock point. However, it does not skew or slow the shot on release. Its lightweight design is completely carried over to the illuminated version with a little weight. This nock is available in pink, red, green, and blue. Its light activates on release with the lasting life of its battery. Its precision standard and overall build quality are second to none. It is also high in terms of accuracy. The downsides of this tool include its non-replaceable battery and its limited functionality. So much information received? All of the items discussed above are important when you are really serious about hunting or its associated activities. The main message here is to ensure that you equip yourself with the best, appropriate equipment. Know whether or not you need a device such as an illuminated rock. Be sure that the product you will choose is of decent quality. It is also difficult to stick to the notable, major brands. It would also be great if you go out in the field of your choice and test this nock. Be as good as a professional along with the proper lighted nock, its equipment, and its practice. How to Choose the Best Crossbow Target for Broadheads?